The human expansion into the Solar System will demand our being able to identify sources of water, a skill we’re honing as explorations continue. On Mars, for example, the study of so-called ‘pitted craters’ has been used as evidence that the low latitude regions of the planet, considered its driest, nonetheless have a layer of underlying ice. The Dawn spacecraft discovered similar pitted terrain on Vesta, as you can see in the image below. These enhanced-color views from NASA’s Dawn mission show an unusual “pitted terrain” on the floors of the craters named Marcia (left) and Cornelia (right) on the giant asteroid Vesta. The views show that the physical properties or composition of the material in which these pits form is different from crater to crater. Credit: NASA/JPL-Caltech/UCLA/MPS/DLR/IDA/JHUAPL. 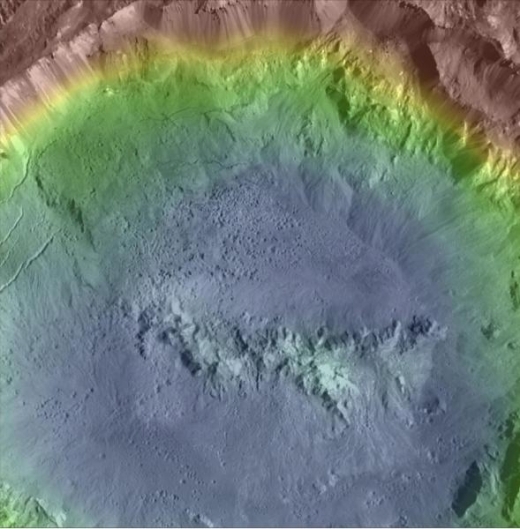 Vesta’s Marcia crater contains the largest number of pits on the asteroid. The 70-kilometer feature is also one of the youngest craters found there. So what accounts for this kind of terrain? Perhaps the water that formed the pits came from Vesta itself. Another possibility: Low-speed collisions with carbon-rich meteorites could have deposited hydrated materials on the surface, to be released in the heat of subsequent high-speed collisions within the asteroid belt. An explosive degassing into space could explain such pothole-like depressions. Haulani Crater, Ceres, showing abundant pitted materials on the crater floor. Similar pitted materials have previously been identified on Mars and Vesta, and are associated with rapid volatile release following impact. Their discovery on Ceres indicates pitted materials may be a common morphological indicator of volatile-rich materials in the asteroid belt. Haulani Crater is 34 km in diameter. Color indicates topography. Credit: NASA/MPS/PSI/Thomas Platz. Sizemore’s team studied the formation of pitted craters on Ceres through numerical models that explored the role of water ice and other volatiles. The morphological similarities between the Ceres features and what has been found on Mars and Vesta are striking. With water ice evidently significant in pit development on two asteroids and a planet, similar terrains will be of clear interest for future missions in terms of in situ resource utilization. Pitted terrain on Mars as seen by HiRISE aboard the Mars Reconnaissance Orbiter. Credit: NASA/JPL/University of Arizona.